Angelica’s appetite for pretending to be other people (or making other people pretend to be other people) knows no bounds. It began with a weird Peter Rabbit/Mr McGregor role-play that I was repeatedly forced into but has steadily escalated, with new characters added daily until we reached the point I find myself at today, which is surely the amateur dramatics climax. I know around seventeen hundred different voices, can make a very convincing stew out of invisible ingredients and can, on demand, drop into an Oscar-worthy impression of an old wizard or a lonely giraffe. I’m like a role-play expert. We do so much role-playing that I’m not sure who I even am anymore. If I don’t snap into character within a second or two, all hell breaks loose. Especially if Angelica has herself already morphed into Peter which – I should point out – takes a lot less energy than my own change into a convincing, evil Mr McGregor. Angelica merely stoops slightly to indicate a non-human sort of stance and then waits with a manic look on her face waiting for me to chase her. “Did you eat all my radishes?” I growl. “My cucumbererererers?” Sometimes I roar so convincingly that Angelica jumps, which is actually satisfying, though I probably shouldn’t admit it. Not that she ever gets properly scared – even when I think I’ve riled her, and I’m about to catch her with my garden net and put her in Mrs McGregor’s pie, she’s never really fully engaged with the fantasy. It’s not just Mr McGregor, either – I have to be witches (“You be witch, Mummy. You be witch – argh!”), wizards, a dragon called Monkey, a monkey called Doodle, a horse, a pig, a woman whose house is a squash and a squeeze. You be Frozen, Mummy, you be Dora. Be Backpack, be Llama, be a sneaky fox! I’m beginning to perfect the art of mime and modern dance, slinking into various characters with all of the pizazz and smooth flourish of a Covent Garden street performer. With a dramatic grimace and a theatrical wave of the arms, I become the Shape Bandit, stealing spots from the bedsheets and triangles from the ceiling joists and throwing them into my invisible shape belt. It’s hard work, but someone has to do it. Perhaps the most taxing type of role-play, though, is being asked to play someone real, someone you know. The favourite at the moment is Grandad. Now you have to be really careful when you do an impression of a real-life person. I mean, which characteristics do you draw upon? And if you simply make things up, because you’re tired (the lazy characterisation), are you unwittingly creating a whole new persona for someone which will then be really confusing for the child when they next meet them? Luckily Grandad has many good, solid characteristics to mimic, including a distinct, melodic voice (he’s from Liverpool and so I like to just say words like “duck” (dooock!) and “book” (boooock!) a lot – I told you it’s lazy) and vast amounts of white, cloud-like hair. The sorts of things that small children easily recognise. So Grandad is a very popular role-play request, not least because he takes Angelica around the (living room) garden and shows her the (armchair) elephant topiary hedge. It only gets weird when Angelica starts to tell Grandad off, mainly for not taking her to see Granny (where the hell do we conjure up Granny from?!) and then I lose track of who I am and what on earth is happening. Oh, it’s all good fun. It does make me giggle. 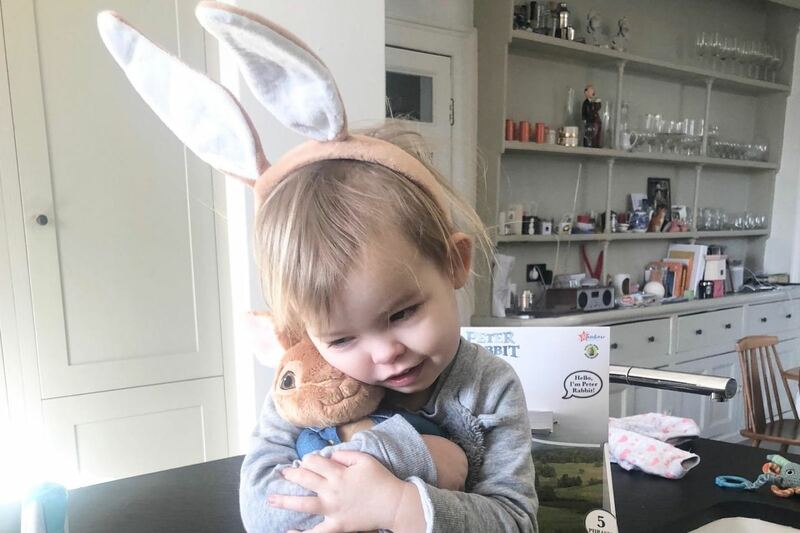 The only time that it wasn’t so funny was when we were out at the shops and Angelica suddenly decided to be Peter rabbit, with a terrified look on her face, but showing no other real indication that she was, in fact, pretending to be a rabbit.